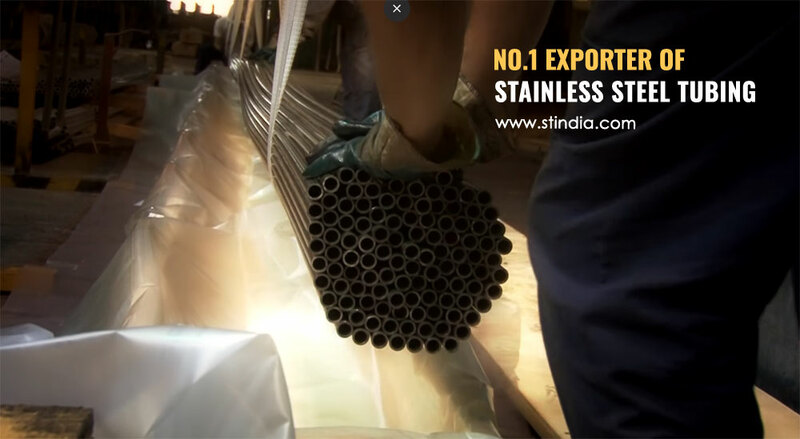 Steel Tubes India is dealing in Stainless Steel tubing since 1975. We are in the business of stainless steel Pipes & Tubes for 3 generations, started as a trader in 1975 now Steel tubes India is a No. Exporter of Stainless steel tubing in India, currently we are supplying ss pipes, tubes & tubing to more than 60 countries, our aim to write this blog is to provide complete & accurate information about Stainless steel tubing, after reading this blog you will come to know each and everything about SS tubing like types of SS tubing, industrial uses of ss tubing, sizes, latest prices of each grade (type & size wise). Know more about stainless steel tubing dimensions, pressure rating chart, weight per foot and many more information. Also get complete details about ss tubing wall thickness, id & od chart, tubing lengths, tolerances & yield strength. View Stainless steel 304 & 316L dom, welded & seamless tubing Specifications. This information is very useful for Engineers, Project Managers, consultants, Researchers working for Oil & Gas, Refinery & Petrochemicals, chemical, pulp and paper, Energy & Power industries, Ship Building, Aerospace, Water treatment plants, Dairy and Food Processing, Construction & many more engineering industries. ASTM A213 seamless ferritic and austenitic Stainless steel boiler and superheater tubes and heat exchanger tubes. tubing sizes and thickness comes 1/8 inch. inside diameter to 5 inch. outside diameter and .015 to .500 inch. ASTM A270 seamless and welded austenitic stainless steel sanitary tubing used in dairy and food industry, SS Sanitary tubing Grade TP 304, 304L, 316 and 316L. comes in sizes up to 4 inches in outside diameter. ASTM A312 seamless and welded austenitic stainless steel sanitary tubing best for dairy and food industry, grade TP 304, 304L, 316, and 316L. comes in sizes up 4 inches in outside diameter. ASTM A511 Seamless stainless tubing suitable for mechanical applications or high-temperature environments. Tubing material can be either cold finished or hot finished in sizes up to 12-3/4 inches. ASTM A778 welded unannealed austenitic stainless steel tubular best for low and moderate temperatures TP 304L, 316L, 317L, 321, and 347 stainless steel tubing come in sizes up to 4 inches in outside diameter. 0.027" 1/8" 0.049" 12014 psi @ 72 Degrees F 6 ft.
0.084" 1/4" 0.083" 10375 psi @ 72 Degrees F 6 ft.
0.055" 1/8" 0.035" 8582 psi @ 72 Degrees F 6 ft.
0.085" 1/8" 0.020" 3923 psi @ 72 Degrees F 50 ft.
0.194" 1/4" 0.028" 3570 psi @ 72 Degrees F 50 ft.
0.210" 1/4" 0.020" 2500 psi @ 72 Degrees F 50 ft.
0.070" 1/8" 0.028" 35,000 psi 1 ft.
0.130" 3/16" 0.028" 35,000 psi 1 ft.
0.190" 1/4" 0.028" 35,000 psi 1 ft.
2.370" 2-1/2" 0.065" 1000 psi @ 72 Degrees F 6 ft. Drawn Over Mandrel tubing is not a type of tubing, but uts a process in which steel tubing is finished.it is produced from SAE 1020 or 1026 steel. intialy it forms into electric resistance welded tube, but in final stage after removing welding layer it becomese cold drawn over a mandrel. The cold drawn process provide a better dimensional tolerance, good surface finish and the strong weld strength. Stainless Steel Seamless Tubing produced as per ASTM A 213, ASTM A 269 and ASTM A 511. Seamless Stainless Steel Tubing used in critical applications like petrochemical, gas or nuclear applications, the most common grades in stainless steel It comes seamless tube are SS 304 and SS 316L, It comes in round, square or rectangular shapes, SS seamless tubing ar best for transport of fluids and gases under pressure and in corrosive environments. Stainless Steel Instrumentation tubing comes in a comprehensive size range covering OD 3 to 50 mm, seamless and welded stainless instrumentation tubing produces in grades 304/304L and 316/316L, SS Instrumentation tubing dimensions and materials conform to ASTM A269 and ASTM A213 and comes in standard length of 20 FOOT, Instrumentation Tubing is also called as precision tubing, Stainless steel Instrument tubing used for instrumentation that controls measuring devices and supplies hydraulic pumps and tools. Stainless Steel Corrugated Stainless Steel Tubing (CSST) is a flexible tubing so it is a best solution to supply gas and highly inflamable material in residential, commercial and industrial buildings, Corrugated stainless steel tubing (CSST) is made of stainless steel with corrugation on the inside or outside. CSST is also used in plumbing applications, SS corrugated tubes are first choice in electric heating, fire sprinkler, and water underfloor heating systems. Stainless Steel Hydraulic line tubing comes in stainless steels and nickel alloys material, High pressure hydraulic tubes made from Type 316 Stainless Steel for maximum corrosion resistance. Hydraulic line Tubing and instrumentation tubing are used in chemical, textile, and pulp industry, high precision hydraulic tubing are best for high pressure applications in the aerospace, High pressure hydraulic tubes made from Type 316 Stainless Steel. Standard Stainless steel tubing is commercial stainless steel tubing made in stainless steel grades 304/304L and 316/316L in standard sizes and wall thicknesses. SS round tube and tubing comes in size range from 12.7 to 506.0, Standard Stainless steel tubes are commonly used in food & Dairy industry. Stainless steel mechanical tubing comes in a wide range of sizes. SS mechanical tubing has excellent machining properties, ss mechanical tubing produces in wall thicknesses up to 3″ thick! Diameters sizes range from 1/8″ up to 96 inches, SS mechanical tubing is used in mechanical applications where corrosion resistance or high temperature or high-pressure is required. Aircraft stainless steel tubing or aircraft stainless steel tube comes in a wide size range and specifications, Type 304 stainless steel aircraft tubing is austenitic steel containing 18-20% chromium and 8-10% nickel. aircraft stainless steel tubing produces as welded, drawn and seamless stainless steel tubing, normally Aircraft or aerospace tubing comes in gauges from .005 through .500 inch, in widths from 12 inch to 72 ft. & lengths from 24 to 240 inch, which is standard size and always cheaper from custom size. Stainless steel sanitary tubing is polished on the outside and inside, it is produced as per ASTM A270 and 3A sanitary standards,available standard LENGTH in SS sanitary tubing is 20 foot, Sanitary Tubing is measured as Tube OD,Stainless steel sanitary tubing is used in food, dairy and pharma industy because it has high corrosion-resistance and it is easy to clean because of both side polish. Stainless Steel Coiled Tubing comes in sizes from 1/4 to 1/2 inch and wall thickness from 0.035 to 0.049 inch.ASTM A269 Stainless Steel Seamlesss Coil Tubing are used for control lines, chemical injection lines, hydraulic and instrumentation systems, also best solution for Airframes, Fuel Lines, Gas Return Tubes, it is produced in grades like SS 304/304L & 316/ 316L. Stainless steel medical tubing comes as thin wall tubing in seamless or welded, medical tubing are produced as cold drawn tubing, SS medical tubing are used in cardiac stent implants, it comes as thick wall or thin wall tubes in seamless & welded, SS medical tubing are also used in Heart Valves, Surgical Implants, Auto Injection Systems, Trauma & Reconstructive Implants. Stainless steel Food Grade tubing produces as per ASTM A270 S2, commonly food grade SS tubing comes in sizes ½ – 8 inch OD (12.7 – 203.2 mm OD) in 20-foot (6.1-meter) length, Grade 316 stainless steel tubing and grade 430 stainless steel tubing both grades are most suitable for food grade stainless steel Tubing. Food grade ss tubemust be internal finish and outer finish as per standards. Marine grade Stainless steel Tubing refers to a type or Stainless steel grade which can be used in marine applications like building boats. it must be highly resistant to moisture, 316 stainless steel contains 16% chromium, 10% nickel and 2% molybdenum. The molybdenum is added to help resist corrosion to chlorides (like sea water and salts) so 316 Stainless steel tubing are Marine grade steel tubing, 316 Stainless Steel Tubing comes 22mm Ø and 1.2 mm Thick must be polished as per marine grade.